Tonight Koa and I bought burritos from our favorite burrito shops: Freebirds World Burrito. 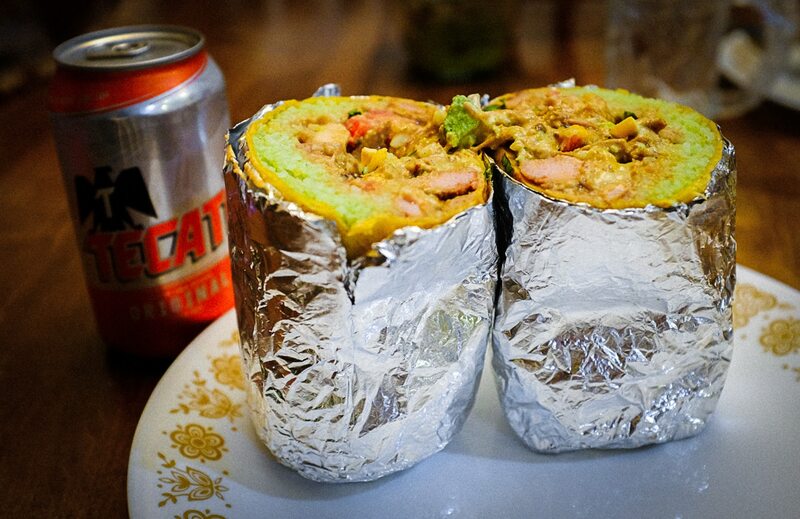 Based in Austin, we find it superior to Chipotle, which was where we often went to get our carnitas burritos. Freebirds has more options for salsas and veggies, the portions are larger, and the vibe is local and more fun. What I especially like about Freebirds is that they have several different salsas to try, ranging from habañero and “Death” on the hot side, all the way down to roasted corn and lime juice on the mild side. In addition to the pico, I’ll get extra cilantro, chopped jalapeño, sour cream, and onion. And that’s in addition to the meat (chicken AND carnitas tonight), beans, rice, and cheese. I’m always amazed that everything fits in the tortilla! In the photo, you can see how big it is compared to a can of beer. It’s so much food, and so, so yummy. There used to be a Freebirds near me (when I lived in SoCal). I agree, much better place than Chipotle. And yes, their salsas were also much better.